5. Remove the dough from refrigerator, and gently roll it inside the cling wrap only to soften it. Using a rolling pin or your hands, stretch the dough to form a long rectangle of about ½ inch thick. Try doing this within the cling wrap only so it becomes easier. Repeat this step for the second dough. Using a ruler, straighten the edges an cut off extra dough. 6. Spread a fresh parchment paper and place vanilla rectangle on it. Brush milk on top of it. Gently lift chocolate rectangle and place on top of vanilla rectangle. Gently using a rolling pin, roll both dough together so that they stick to each other and don't separate when rolling them into a log. Milk will help in binding the two strips. 7. Roll the dough from the longer side toward you as tight as possible for firmer shaped rolls. You may need to use both your hands and proceed slowly. Pinch the seams to seal it. Turn over the roll so that the seam is facing down. You will be left with a long roll. 8. Cover this ready log gently in a cling wrap and refrigerate for 1 hour. Preheat the oven to 180°. 9. Remove the dough and carefully cut them into round cookies. 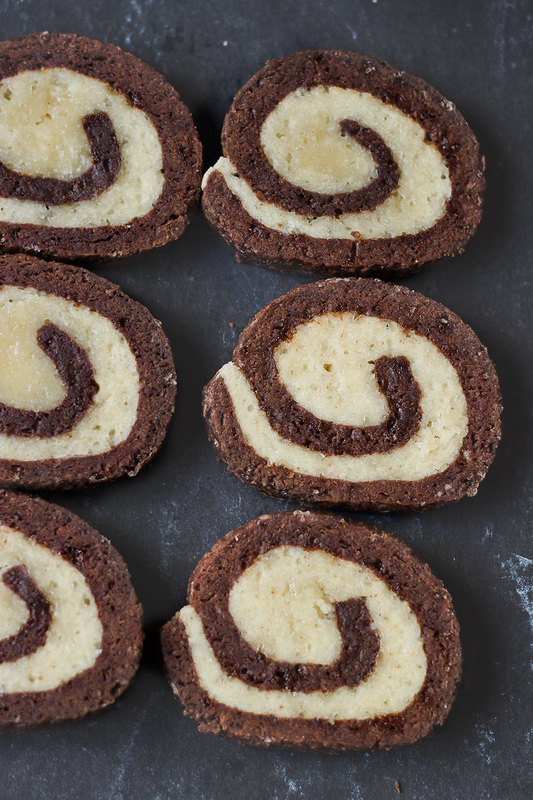 Place on a cookie sheet, one inch apart and bake for 12-13 minutes. Cool on a rack and store in an airtight container.